Different shapes and sizes are available with us. You can take your card game to the next level with custom shapes and sizes. You may take a shape or size that we already have or go for an all together new shape. We have done card decks for many clients with customization on the card size. Below are a few samples for you to check. Our cutting collating plant is equipped to put your cards above the rest. 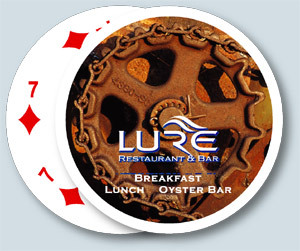 A Triangle, a Circle, a heart shape or an Oval shape for the cards will appeal to a certain group of players. Ask us for a special shape and we shall do that for you. With the production facility available with us and the latest printing setup, it’s all a matter of time that we create your concept into reality. Cards in the shape of a house. Yes it’s as standard as a standard rectangular card deck, for us. No additional costs. We have been making games with 25/30/40/48/50 cards per deck to games that need higher number required per deck. 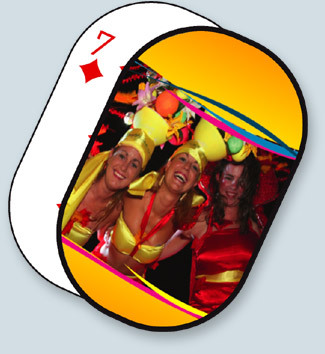 You can take this special card shape at the same basic quotes that we offer for normal playing cards. It can be in the shape of an apple, an oval, a triangle or a circle or for that matter any shape you require. A custom shape card deck will add value to your game set. We have different sizes available for these shapes. You can take a square card of size 2.75” x 2.75” or a larger square of size 4” x 4” or even larger square size of 5"x 5". These custom shaped cards have been used by many companies to create awareness about their products. 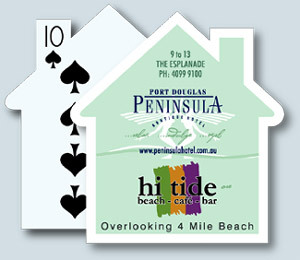 The House shaped cards work great for real estate, home improvement companies etc. 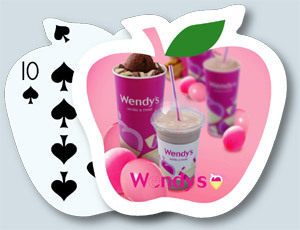 Our apple shaped cards are wonderful for education and health care. Round cards have been used by big Pizza companies with details of different Pizza toppings and servings coming on the card fronts. Do you want more families eating at your restaurants. These cards will definitely help boost sales. Do you have a different card shape in mind. Talk to us. 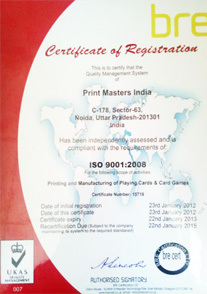 We have the infrastructure to create any particular shape for any number of cards. The Triangle shaped card decks have been created for a game company in the states. 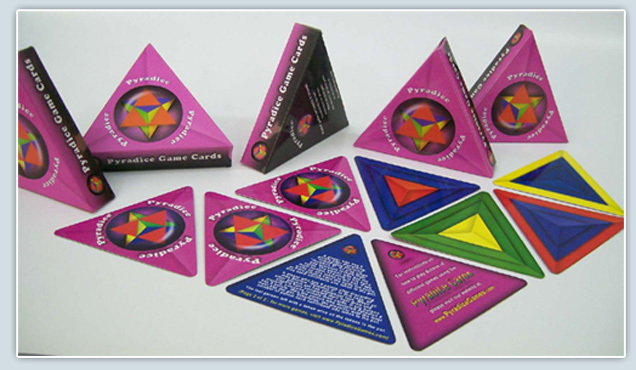 One of the most enjoyable Pyradice games uses these 64 multi-colored triangular shaped cards. The face of the card reveals three concentric triangles (one within, or on top of, the other). Each triangle is colored green, blue, yellow, or red. The sequence of the three colored triangles (from outer to inner, bottom to top, largest to smallest) produces 64 unique cards. They are used in traditional ways as you draw and discardthem to build a winning hand. The game package includes a set of 64 cards and an instruction book for playing several enjoyable games. Chards® uses a deck of 52 cards (Chards®) with the normal suits: Hearts, Spades, Diamonds, and Clubs. Each player selects a favorite suit, places their King on the board and begins to play. Chards® are added to the board during play anywhere on the board so the playing field—and challenge—is always changing. Chards® is an example of square cards. 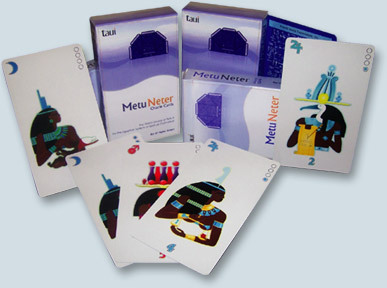 Metu Neter : The multicolored metu neter oracle deck is a 70-card divinatory companion to metu neter, by ra un nefer amen, a best-selling book on the egyptian oracle of tehuti. In conjunction with the book, these cards open up the divinatory powers of the egyptian gods and their correspondences with modern life. Not for the faint-hearted, this oracle demands a pure attitude and clear heart! 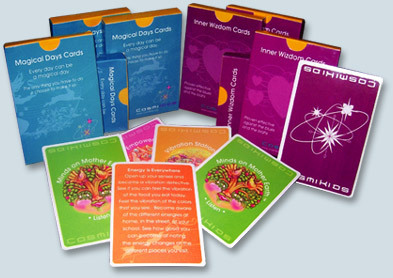 Magical Days Cards and Inner Wisdom Cards are a special size with less number of cards per deck.